Last night, I woke up to the sounds of thunder. Being the light sleeper that I am, it made it difficult to get a full night of sleep. During my tossing and turning, I reflected on who I was just a few years ago. I don’t know when it began, but at some point in my adult life I developed storm anxiety. I did not have a problem with rain, but severe storms put me on edge. In Nebraska, we have tornadoes. I have had some pretty close calls, but have been lucky thus far. Though, the proximity of these violent storms made me panicked. I fear the things I cannot control. 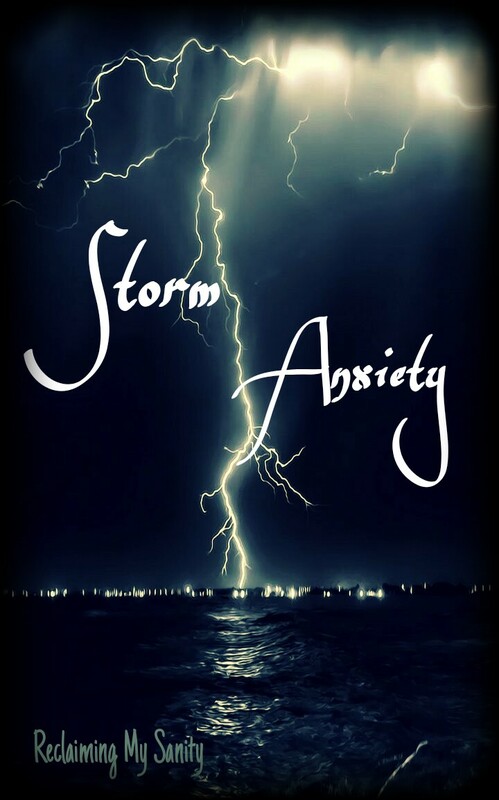 Storm anxiety, for me, is like a twisted stomach, stomach in knots, heart racing, and panicking sort of feeling. Feeling like I am awaiting doom. It is not pleasant. I remember one time when Chris and I lived in our first apartment, after getting married (we lived in one before getting married also). There was one night it was storming outside and I was really trying to not let it bother me. It was the middle of the night and I had the news station turned on. All of a sudden the tornado sirens were going off, but they sounded a little different. Regardless of the difference in sound, there was absolutely nothing about it on the news. I tried to wake Chris up, who sleeps like a brick by the way, and he couldn’t even stay coherent enough for me to get two words in. I kept pacing from the window to the t.v. trying to figure out what the heck was going on. The storm diminished (it really wasn’t even THAT bad of a storm) and I eventually zonked out. I found out later in the morning that it was a malfunctioning siren. Seriously. Talk about a pointless panicking. I think it was then I realized I needed to do something about this. I didn’t want to be the cry baby who panicked every time thunder and lightening were happening. Being pregnant at the time helped too because I thought if I panic, I could stress the baby out and go into early labor. I had to start having the mind set that, I cannot control these storms. If a tornado kills me or I get hurt in a storm, then what else can I do? The only options I have are to either be dead or continue living under the circumstances (survival mode). I started to become my own meteorologist. I paid close attention to the news and radars to gain better knowledge about storms. More so, to gain knowledge about how to track a severe storm and preparedness. It has been an ongoing process. I am not as terrified as I once was. I can actually watch a storm through a window or glass door now. It seems silly to many I am sure, but it is so nice not panicking at the thought, sight, or sound of a storm rolling in. I have actually slept through some less severe storms, but the louder ones tend to wake me up still. It is progress nonetheless. It was a goal that I had set out to achieve. Even though it has taken a lot of time and effort, I am a lot better off now. Do storms freak you out? Are you a storm chaser? Let me know in the comments! The places I’ve lived in, we don’t get such powerful storms so I can’t say whether I have storm anxiety or not. Probably I’ll be a bit intimidated the first time I witness one with all the wind noises and stuff flailing around but I’m sure it gets better. For me personally, during depressing times of my life, most of them occurred during rainy season (sometimes also during the off season rain) so whenever I see a rainy/clouded day, I just feel a little sad inside. Thankfully, it’s widely sunny outside right now here. It has been raining off and on for 24 hours now here. It makes me more sleepy than usual. It is weird how the body responds to things like weather. Yes, the wind makes things much worse! Granted, I have not been in a hurricane, but the severe weather we do get is more than enough for me. You should probably take some rest now and just “weather the storm” I guess.